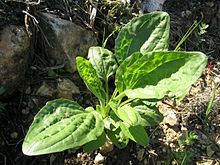 Plantago is a genus o aboot 200 species o smaw, inconspicuous plants commonly cried plantains or fleaworts. ↑ "Genus: Plantago L". Germplasm Resources Information Network. United States Department of Agriculture. 2006-04-20. Retrieved 2011-03-04. This page wis last eeditit on 28 Julie 2016, at 20:18.